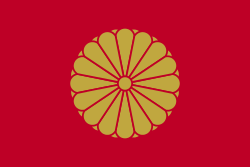 Emperor Ankan (安閑天皇, Ankan-tennō) was the 27th emperor of Japan, according to the traditional order of succession. No firm dates can be assigned to this emperor's life or reign, but he is conventionally considered to have reigned from 531 to 536. 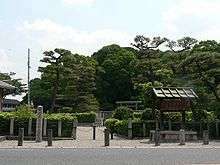 According to the Kojiki Ankan was the elder son of Emperor Keitai, who is considered to have ruled the country during the early-6th century, though there is a paucity of information about him. When Ankan was 66 years old, Keitai abdicated in favor of him. Ankan's contemporary title would not have been tennō, as most historians believe this title was not introduced until the reigns of Emperor Tenmu and Empress Jitō. Rather, it was presumably Sumeramikoto or Amenoshita Shiroshimesu Ōkimi (治天下大王), meaning "the great king who rules all under heaven." Alternatively, Ankan might have been referred to as (ヤマト大王/大君) or the "Great King of Yamato." The most noteworthy event recorded during his reign was the construction of state granaries in large numbers throughout Japan, indicating the broad reach of imperial power at the time. Memorial Shinto shrine and mausoleum honoring Emperor Ankan. Ankan's grave is traditionally associated with the Takayatsukiyama kofun in Habikino, Osaka. ↑ Ponsonby-Fane, Richard. (1959). The Imperial House of Japan, p. 44. ↑ Kelly, Charles F. "Kofun Culture," Japanese Archaeology. April 27, 2009.